The latter half of the century dawned with the 1st Battalion still in Germany, but by then at Iserlohn and still suffering from the effects of constant changes which, with the short period of National Service, created an atmosphere of restlessness and impermanency. Battalion reports commented, "Even games suffer from the officers in charge having to be constantly changed". Despite such difficulties and adversities the Battalion competed successfully in the Inter Unit Drill Competition. After winning in the Brigade they went on to finish second by only six points to the 2nd Bn The Grenadier Guards in the final Divisional Competition. Successes were shown by the Basket Ball Team who won the British Troops Berlin Championship the BAOR Championship and the Army Championship at Aldershot in October. 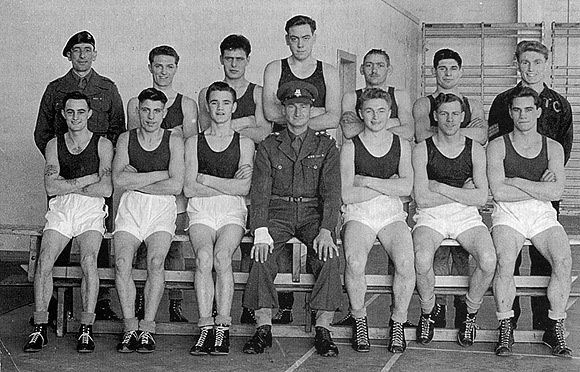 Willllers Army Basketball Championships, Aldershol, December 1950. Standing: PIe Barrance, L/Cpl Mabey, Sergt Harrison (RAEC attached). Sitting: Pte Gray, Cpl Dunkeld, Sergt Kirkman, L/Cpl Travers, Sergt Morris. Hockey was a much improved pastime with the Battalion 1st XI maintaining their previous season's unbeaten record by completing the first half of the Berlin Winter League programme without loss. In the first match of the BAOR Cup the Battalion held the 10th Anti-Tank Regiment RA to a 2 goal draw, defeating them 2-1 in the replay. Defeat by the 1st Dorsets occurred in the 2nd round. Further successful matches were played in the Brigade Inter Company Knock-out Tournament and the Inter Company Tournament. Aquatically the Battalion swimming team came second to the 1st Royal Welch Fusiliers in the BTB Championships, and several members of the Battalion were included in the BAOR Team for their match against the United States and French Armies. The final result was BAOR 43 points, USA 42 points, French 5 points. At tennis Maj C J Grindley and Capt R D T Fletcher won the BAOR Inter Regimental Doubles Cup for the second year in succession. Maj Grindley also won the BAOR singles championship as well as being a winner in the Open Army Doubles. The Inter Company Efficiency Shield was won by "HQ" 2 (Adm PI., Mortar PI. and the Band) with a total of 43 points. B Company were runners up with 39 points. At the Depot reasonable results were obtained at football. Of 15 matches played 10 were won, 3 lost and 2 drawn. The Regiment were entered for the Army Hockey Tournament but were beaten 6-1 by a much stronger side from Eastern Command. The 5th Battalion (TA) obtained good results in shooting, gaining 3rd place in the Belhaven Cup when the first two places were won by Regular Units. Nine members represented the Battalion in the Home Counties District Rifle Meeting at Shorncliffe in August and prizes were won by Lt Saunders, C/Sgt Ellis, D/Maj Newman and Pte Day. C/Sgt Ellis and Pte Hunwicks were selected to shoot for the TA in the Inter Services Small Bore Competition. In athletics the Commanding Officer, Lt Col J B H Kealy DSO represented the Army v the Royal Navy and Royal Air Force in the Inter Service Athletics. Still in Iserlohn the 1st Battalion were having some success at football. 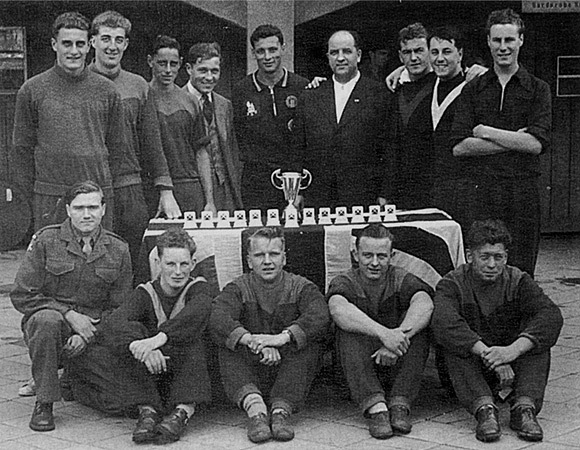 Of five matches played in the Army Cup they won four and lost one. Reaching the semi-final of the BAOR Section of the Cup they were, however, defeated by the 23rd Field Regiment, Royal Engineers. A creditable cricket team found little scope for matches and only four games were played due to other commitments. 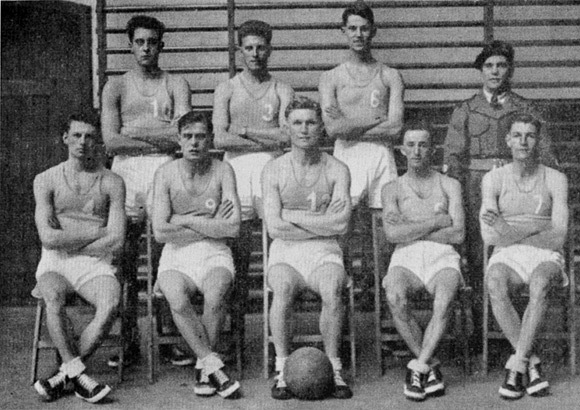 The Basket Ball Team were in fine form after having won the Army Championship at Aldershot in the previous December. Of thirty matches played in the Championship they won twenty-seven, lost two and drew one. In the BAOR Boxing Competition the Battalion lost in the first round to 22nd LAA Regiment RA, by five matches to six. Pte Matcham, Light Welter-Weight, fought a distinctive bout. Flooring his opponent three times in the third round he was awarded the victory when the fight was stopped. At the Battalion Rifle Meeting at Menden Ranges Maj H R D Hill MBE scored personal triumphs by winning the Individual Championship, the Pistol Championship, the Officers' Challenge Cup and the Officers' Pistol Cup. The Pink Column was retained by the Sergeants for the second year running while B Company won the Company Shield. At the BAOR Meeting the Battalion was placed eighth out of twenty-five teams. The 5th Battalion (TA) were having a reasonably successful shooting season. Several prizes were won at the Home Counties District Rifle Meeting while at the Battalion Rifle Meeting B Company cleared the board by winning the Inter Company Rifle, Bren and All Weapons Competition. In the Kola Aggregate Challenge Cup the Divisional Team were second and were awarded Bronze Medals. The strength of the 1st Battalion still atationed at Iserlohn had changed very little although there had been almost a complete change over in the Officers', Sergeants' and Corporals' Messes. Shooting standards showed improvement.The Company Shield was won by Support Company and the Individual Championship was won by Cpl Grimwood. The Pink Column was retained for the third year running by the WOs' and Sergeants' Mess. In the re-instituted WOs and Sergeants v Corporals Match the latter were comfortable winners. At the Rhine Army Small Arms Meeting the Battalion came fifth out of twenty-seven teams competing for the Rhine Army Shield. The LMG pairs team shot very well in the team matches, securing second place with a score of 828 points. Further successes were obtained at other Meetings. Capt D C Snowden TD, on completing his tour as Adjutant of the Battalion, presented a silver cigarette box on which was to be inscribed the name of the officer with the highest average in the Christmas Competition. 2/Lt R C Rolls was the first winner with an average over five shoots of 93.8. Another recipient of an inscribed cigarette box was AQMS Stone, REME to whom tribute was paid for his work in improving the shooting of the Battalion Team. At Hockey, in the Quarter Finals of the BAOR Cup, the Battalion were beaten 1-0 by the 1st Battalion The Somerset Light Infantry. Outstanding success was achieved by the Basket Ball Team who won the Army Inter Unit Championship, the BAOR Championship and the Divisional Championship. In boxing there were some hard fights. Victory went to the 1st Battalion The Royal Irish Fusiliers by one point in the BAOR Championships but the Queen's defeated the 23rd Field Regiment RE, in the first round of the Division Inter Unit Championships. Four fights were won by the Team by knockouts. In the Quarter Finals of the BAOR Championships (Eliminating Contest) victory again went to the hard hitting Royal Irish Fusiliers. Winners 2nd Infantry Division Championships. Outstanding successes were gained at a Cross Country Meeting at Llanelly Barracks, Hubbelrath on the 30th January. In the Divisional Cross Country Team Championships more than 100 runners from 11 Units battled over a snow covered course. Pte Hyde was the winner after running a very fine race in 34 minutes 19 seconds. Pte Roath followed in third place with Queen's men then taking consecutive 6th, 7th, 8th, 9th, 10th and 11th places thereby gaining a total score which was unassailable by any other team. In the BAOR Finals, against much stiffer opposition, the Queen's came fifth out often. Swimming showed mixed results due to practice and training difficulties but four out of five events were won at the Brigade Meeting and at the Divisional Championships Dusseldorf BAOR Meeting every event was won. At the BAOR Hohne (Finals) there were mixed results against the Life Guards and BAOR Headquarters. Enthusiastic training under 2ILt Giffard resulted in a determined team taking part in the Division Skiing Championships from which they emerged overall winners, a truly outstanding achievement. Shooting results were mixed but at the Home Counties District Rifle Meeting RSM Kettle won the Champion at Arms Trophy and Pte Hayter won a silver spoon in the Young Soldiers' Class. Results of the Depot Rifle Meeting were:- Individual Champion:- RSM W Kettle, LMG Pairs:- Cpls Bushell and Riley, Sten:- Cpl Bushell and Young Soldier:- L/Cpl Franklin. The 5th Battalion (TA) reported no sporting activities except shooting. Beside the Battalion Rifle Meeting and Annual Range Course, at the Brigade Rifle Meeting Inter Unit Teams Competition they were the winners. They also won the District Rifle Meeting Inter Unit Competition. Also partaking in shooting, the 6th Battalion (TA) were placed second at the Brigade Rifle Meeting in July. Capt ARC Spencer won the Champion Rifle Cup and was runner-up as Champion at Arms. At the Divisional Rifle Meeting in August the Battalion Team were runners-up in the Falling Plate Competition. Pte Lloyd of Support Company was recommended for his fine shooting. At the Brigade Boxing Championship Meeting Pte A Lines won the Welter-Weight Competition. 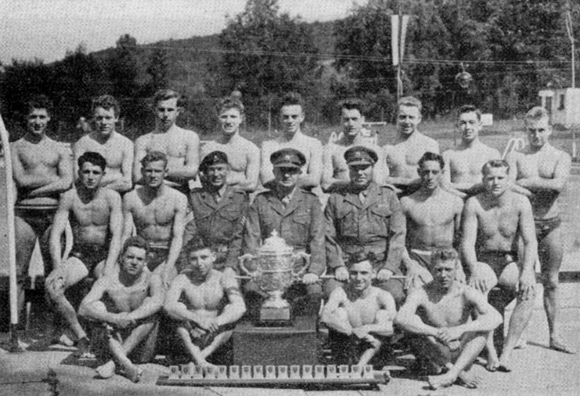 1st Bn The Queen's Swimming Team, Winners Rhine Army Swimming Championship, 1953. Pte Searle, Pte Morley, Pte Marsh, Pte Scullhorpe. Front row: Pte Walers, Pte Cook, Pte Loveland, Pte Thorpe.